After more than 40 years of construction, the Tropical Botanical Garden of Xishuangbanna has made remarkable achievements. Its beautiful landscapes and enriched scientific contents make the Gourd Island, which occupies a land of 900 hectare, become one of the first AAAA Class tourism spots, popular science education bases, patriotic and popular science education bases in Yunnan province. It is now a showpiece for the opening of Xishuangbanna and Yunnan province. The Chinese leaders and people in all walks of the society care for and support the development of the Tropical Botanical Garden of Xishuangbanna. Many leaders of the central government paid visits to the Garden personally and gave their instructions regarding the work of the garden; and many of them planted trees in memory of their visits. Many famous foreign guests and royal family members also paid visits to the garden of intensify communications, and they also planted some trees. Because all of the above, the Botanical Garden is now in possession of a new park, park of famous trees planted by celebrities. The park of famous trees situates in the middle of the Tropical Botanical Garden. It occupies a land area of 55 mu and is the major place for sightseeing. Within the park, the visitors can see a Adenanthera pavonia tree planted by President Jiang Zemin, a Mesua ferrea tree planted by Li Peng; there are also plants and trees planted by famous people of the world, such as the "giant of rain forests"- Shorea chinensis (Wang Hsie) H. Zhu planted by Prince Philip, Chairman of the World Wild Animal Fund, the Cambodian Southeast Dracaena planted by Professor Cai Xitao, the founder of the park etc. 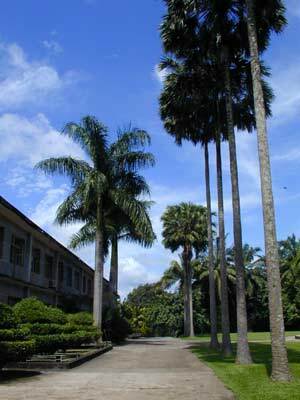 Besides, the gardeners also planted many ornamental plants, such as the Buddhist plants of the Dai folks - talipot palm and travelers tree, which looks like a peacock in its pride, the most poisonous plant of the world - Antiaris toxicaria (Pers.) Lesch., the largest water plant - royal water lily, and all sorts of ornamental plants - copperleaf, colorful wild flowers, such as Mayodendron igneum (Kurz) Kurz- which grows out of aged stalks and its flower looks as if a butterfly is flying, color-changing flowers -changeable rose mallow,Cottonrose Hibiscus, and Cycas pectinata Griff, where the male and female plants are in different plants.